As introductory to this reflection, credit goes to Fr. Michael Hayes, whose homilies had been collected and shared after his death. It is endlessly fascinating to know that God has come into the world in the person of Jesus. It is even more fascinating to know that he keeps coming into our lives day after day, year after year. But this historic event, this ongoing event, is much more than interesting. It is obligating. Today's Gospel reading highlights this aspect of Advent. John the Baptist had been preaching in the Jordan River valley, proclaiming the coming of the lord. The people were captivated by his message. But those who believed also became involved. They felt a need to respond to this event. When John had finished preaching, the crowd gathered around him and asked: "What then should we do?" This was and still is the appropriate response to the coming of Christ, the greatest event in all of history. God has come to live among us and be known by us. We cannot just go on with business as usual; we need to do something. "What then should we do?" We are waiting for Christmas. We are expecting Jesus. Yet, Jesus is here, isn't he? First, he lives in all the world. He is everywhere. He has to be because he is God the Son. Second, he lives in this sacred place in the tabernacle as the Bread of Life. He is here as truly as you and I are here: body, blood, soul and divinity. Third, Jesus lives within us, each of us, always - as long as we love him, as long as we have faith in his Last Supper promises. 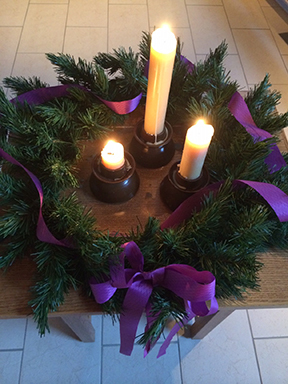 This Advent, we rejoice as we experience him here.